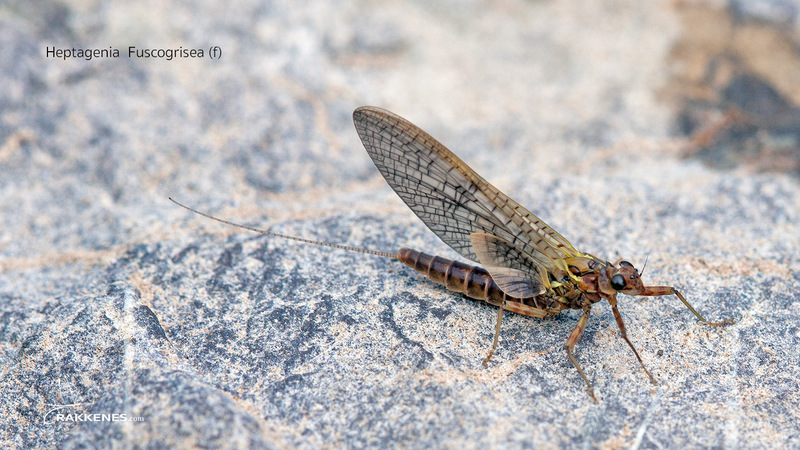 Together with the Ecdyonurus Joernesis, the Heptagenia Fuscogrisea is an easy mayfly to identify. Also known as the Brown May Dun, the Fuscogrisea is a good mouthful for hungry trout. The fly was discovered in Norway in 1783, then named Edyonurus fusco-griseus. 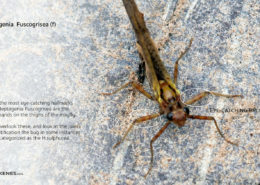 The bug is among the biggies in our water. Although literature state that they vary between 10-14 mm in length, I usually find them in the range 12-13 mm in the waters where I fish (Trysil, Norway). The Heptagenia Fuscogrisea is brown on top, but turned around you’ll see that the color the fish see is olive with brown undertones. The wings of are brown just after hatching, but really quick turn transparent with a pale yeallow tint. The Fuscogrisea has large backwings, and distinct black veins on both wing pairs. The two tails are barred and pale yellow. Legs are golden olive, with brown/cherry bands on each thigh. The Fuscogrisea is one of the easy flies to identify. There are three distinct features to look for. First look underneath the fly, and identify the elevated area between the second and third pair of legs. The two lines on the elevated area should converge at the front, forming an upside-down V. Compare this area with the Joernesis where these lines run in parallel. Secondly look at the legs. The Heptagenia Fuscogrisea has two brown or cherry colored bands on each thigh. This is the most visual and easy identifiable characteristic of the fly. 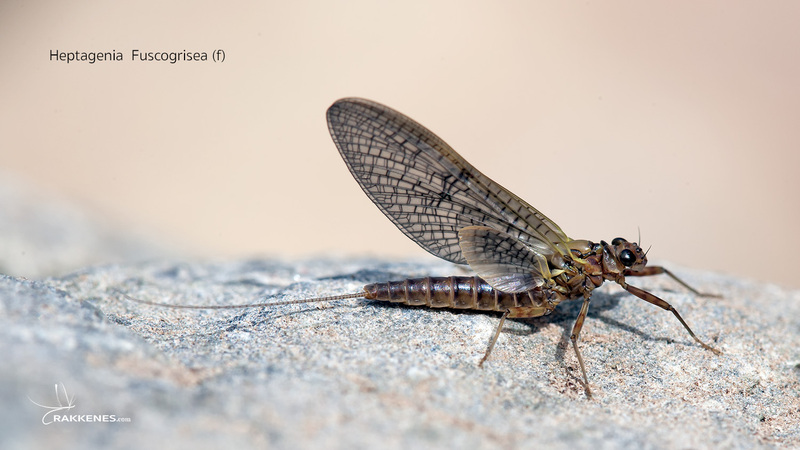 If you’re early in the season and stumble across a brown/olive colored mayfly about 12 mm, dressed up in cherry garters, you have found th Heptagenia Fuscogrisea! Third. If you want to go scientific, look for the first joint on the back leg. It’s longer than all the others. But really, in practical terms it is sufficient to look for the garters on the thighs. 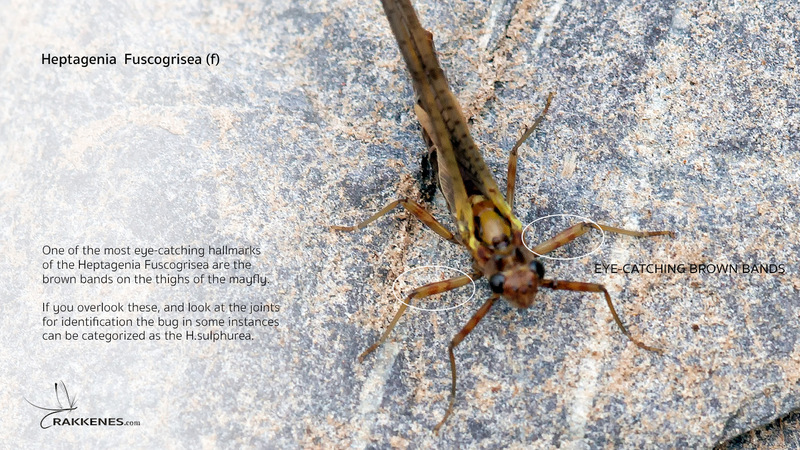 The Heptagenias are really low riding bugs when on the water. Therefore, you should look for a pattern with the same characteristics when imitating the dun. The low riding characteristics of the real thing has one clear consequence for me. I never fish them with a collar hackle (catskill type), but opt for an Comparadun, a profile dun or even an extended body imitation. As a size and profile fly tier, I am not that picky about colors. Roughly right is ok. For this fly I would choose a color similar to the Fly Rite #10 Blue Winged Olive or Fly Rite #45 Mottled Caddis/Pale Yellow Olive for the abdomen and thorax. The hackle for this one is a grizzly. I use a dyed golden olive or a plain olive grizzly rooster hackle. The tails are either fibettes in the same color, or barbules from the hackle. 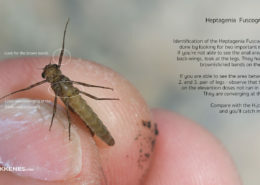 Hook: A standard dry fly hook in size 12-14. 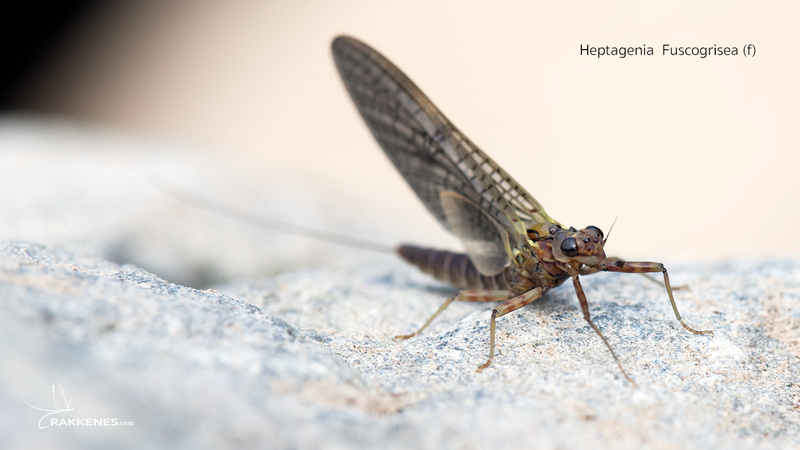 I am building a database rich with photos, illustrations and imitation tips on the mayfly species found in the Trysil region in Norway. 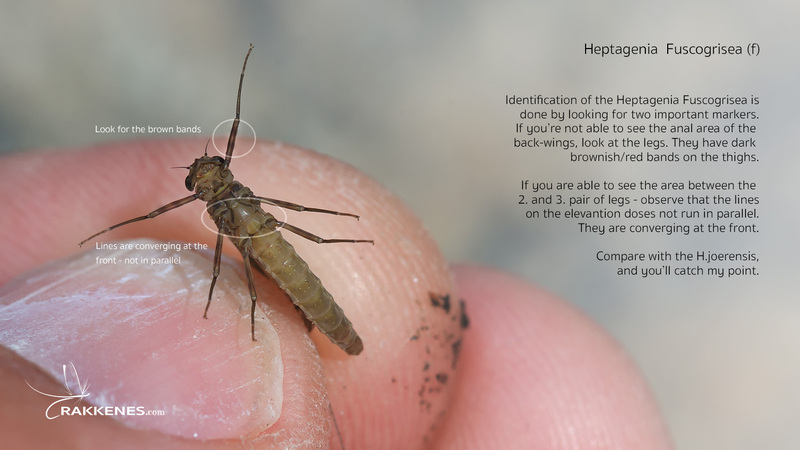 Most of the mayflies are found all over the world, and these guides are thus universally useful. Here are the articles published this far on the Heptagenias.